Do you want to know what cigarettes really do to your body? 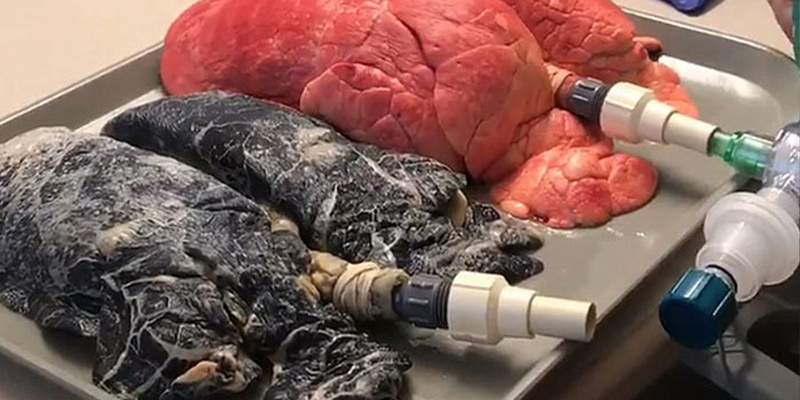 This shocking video captures the difference between a heavy smokers lungs and someone who had a healthy set. This video shows black, cancer-ridden lungs which failed to properly inflate, in comparison to the healthy, red lungs of a non-smoker. The non-smokers’ lungs managed to fill to capacity before they slowly deflated as normal. Uploaded by Amanda Eller, a North-Carolina nurse, the video has picked up and made its way around the internet, being viewed millions of times in the process. Warning the video is graphic. According to public health charity Ash.org.uk Around 9 million adults in the UK smoke cigarettes: 19% of men and 15% of women. Two-thirds of smokers start before the age of 18. Smoking accounts for 30% of cancer deaths and 87% of all lung cancer deaths. Male smokers are 23% more likely to develop lung cancer compared to non-smokers. Smoking is also associated with an increased risk in at least 15 types of cancer and causes an estimated 5 million deaths worldwide a year. But cancer is not the only issue, as it is reported that nearly half of long-term smokers will die from a smoking-related illness. The larger risk comes from vascular diseases such as chronic obstructive pulmonary disease, which restricts breathing and comes largely in the form of chronic bronchitis or emphysema.